On July 7th, Warriors submitted 2 floats during the high-profile Cherry Festival. Efforts were directed toward for Great Lakes Warrior Sailing in Traverse City, MI. 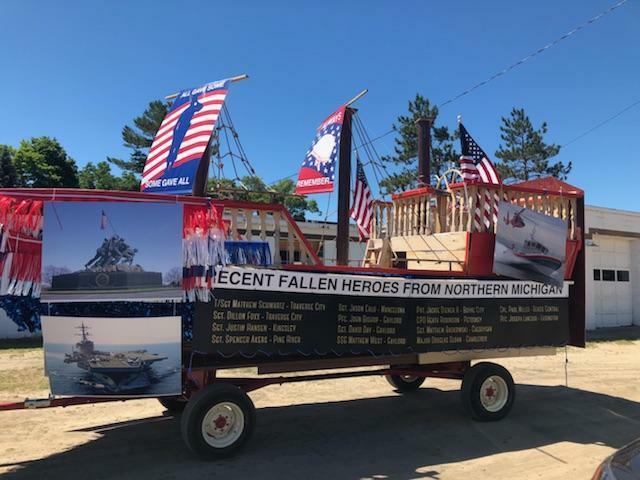 Their J-22 transformed into a float and they made a “Remember the Fallen” float, which won them a 1st prize for best float and a cash prize. The program trains using Warrior 43 on most Wednesday nights and will also compete using their new J-22. Sailors like retired Army nurse Page Sikes, Scott Ford, and Josh Agripino, have gone above and beyond to raise awareness, round-up more donations, encourage local support, and welcome and train new warriors as well as connect and race with the visiting Warriors from the Warrior 53 crew. Learn about ways to Support Warrior Sailing here.